The Electric Panda has moved! New and improved with WordPress 3.0! ssmariner Flossberg is back with another hot new music video tribute, this time recreating the 90’s favorite “Virtual Insanity” by Jamiroquai. You may remember the last time I posted an ssmariner video when he did Michael Jackson’s “Scream.” This time he’s back with a different star, Lux Yao, along with guest appearances by eeka Batz, Catero Revolution, violet Morellet and himself. I remember this song from back in the day and it’s so refreshing to see it re-created in the virtual world. Flossberg’s videos are just one of the many ways users in Second Life are pushing the limits of what you can do with music. You can find his other videos and blog posts at An ear full of a blog. Here’s another sweet new machinima that I found from Second Life Update. The Youtube page lists the poster as Melanie Kidd, but a search turned up an empty profile page so I’m not exactly sure who made it. Second Life Update isn’t the best resource for details so we may just say in the dark on this one. Either way, it’s a bitchin video and you should check it out. Second Life music video machinima ftw! When I started this blog, one of the first things I mentioned was how amazing music has become in the way that we share it, listen to it and play with it. The internet has revolutionized the music industry, propelling the role of music in our lives to incredible heights. Ben Parr, a writer for Mashable, recently posted an article about the internet and its role in the rise of social music. He writes about its humble beginnings, the growth of MP3’s, illegal sharing, legitimized applications like iTunes, and the use of music social networks like Last.fm. The last few years has also seen innovations in music-themed entertainment, namely the popularization of games like Guitar Hero and Dance Dance Revolution. The idea has been around since about 1996 when PaRappa the Rapper was one of the first rhythm based video games of its time, but has since become a major force in the video game industry. So what happens when you introduce a social aspect into the world of music based video gaming? You get Loudcrowd, a “music community for people who want to do more than just listen.” Loudcrowd is a DDR type gaming site where users complete dances and challenges to unlock clothes, music tracks (that come with additional challenges) and more. 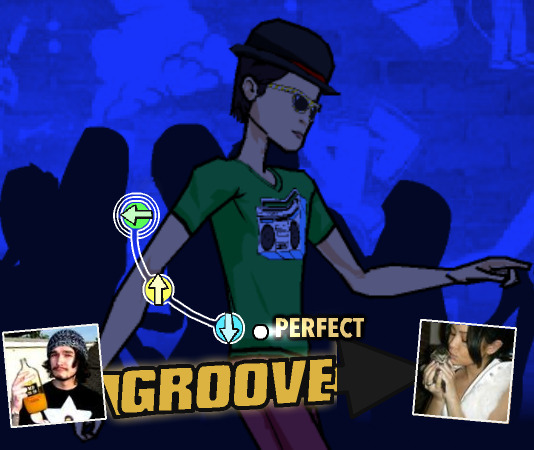 Players have two options for building up their battery meter to unlock items, either sending dances to other users or completing solo challenges. It can be pretty addicting, and I’m not the only one who has spent quite some time playing around with the dance challenges. Loudcrowd has made a good attempt and mixing social networking, video gaming and music discovery. Although I’m a fan of what the site is trying to do I’d like to offer my observations and a few suggestions as to how the site can improve and fulfill its objective. Loudcrowd has taken rhythm based video gaming and infused a social aspect to it. Players hang out in a lobby together where they perform dances for one another and complete challenges. Dances can be sent to other user along with a short message after the DDR-type minigame is completed. For some reason there is no local chat feature, communication is limited to one on one conversations with other players. In order for there to be a healthy music community, there has to be an open discourse where users can share information with each other and contribute to the dialogue as a whole. Even if they didn’t want to have open chat, at least make forums available. Especially since the site is in beta, users should be able to look at each other’s ideas and be able to expound off of them. It’s also slightly frustrating that the messages are limited to 60 characters (And you thought Twitter forced you to be concise!). I think it’s a brilliant idea that users can keep up a conversation by means of sending dances to each other, but it’s difficult to have any kind of meaningful discussion other than flat “Hey, what’s up – Not a whole lot, you?” kind of talking. Users can take the discussion to straight up instant messaging, but you have to choose between the two as the game can move pretty fast. Loudcrowd should up the character limit to dance messages, letting users engage in complex discussions without sacrificing the fun of doing it through video gaming. I had asked a few regulars (all of whom had reached the level limit on the site) how many friends they had made in Loudcrowd and only one or two responded with a number more than 3. In a site that is trying to promote a community, users should be able to develop a bigger network. It appears that the primary function of Loudcrowd‘s site is video gaming, and for something that’s offered for free on the internet, its a lot of fun. Players can select up to four difficulty levels on different challenges in the game. There’s the rhythm based dancing mini game, a fill-in-the-blank survival minigame and a turntable mini game. The three different challenges help mix it up and give users options on what they want to participate in, but they can get stale after a while. Anyone I talked to on the site thats been there more than a week has said they’ve gotten bored with the gameplay. This is fine if they’re trying to offer a casual gaming site for people to spend a few minutes on every day to kill some time, but fails if they are attempting to create a solid destination for players to immerse themselves in. The revenue model is based around buying upgrades for storage space on the items you can unlock, but when the site isn’t offering a continuously entertaining video game challenge, or items that affect and improve the experience, then it’s hard to see how people are going to stay on the site. Loudcrowd says they are introducing new games every two months, and I wonder if that’s too long a time span to keep players constantly engaged. It’s a great idea to keep expanding its gaming options, but it’s also important to build upon the mini games already in place. Players can level up through accumulating points and ideally it’s supposed to unlock better items through the challenges, but players level out at 50 and most level 50 players I met said they did it in less than a week. I’m at level 10 after an estimated total of 5 hours on the site, and haven’t noticed any increase in the variety of options. The reason why a game like World of Warcraft is successful is because there is something to continoulsy strive for, the experience expands and improves with every challenge completed. Even though Loudcrowd is operating on a much smaller scale than WOW, it has to give players an incentive to keep playing. Expand the clothing options, offer items that actually affect the game play like power ups that can be used in challenges, and either up the level max or make it harder to level out. No game should be TOO easy. Lastly, I’d like to see a larger focus on competition. With a DDR model in the dances, players need to be able to compete against one another and not just themselves. Some of the mini games and track challenges offer score charts where you can compete on the scoreboard, but players want to be able to compete directly against each other. The whole winner/loser dynamic may not be the biggest self esteem booster, but it’s usually why people play engage in multiplayer games in the first place. To start off, I have to say that the music on the site is great. It’s all mostly independent electro (a scene that has been really taking off the last couple years in the music community) bands from partnerships they’ve secured with record labels like Beggars Group, DFA, Domino, Downtown Records, and Modular. This makes sense with the type of gaming that’s offered, but it’s not the only genre of music that has a beat that works in the system. From the feedback I’ve gotten it seems that most of the users aren’t necessarily electro heads, and some have said they just turn off the music after a while. Targeting a specific genre is all well and good when you are appealing to one area of the music community, but when your audience has varied musical tastes I think it’s important to cater to that. I would also like to see a larger selection of music offered, even if they stick with a pure electro theme. The playlist changes every week but the songs come from a selection of about 4 or 5 artists, and I’ve heard repeat songs during 30 minute gaming sessions. It would be cool to see a comprehensive playlist, one that emphasizes the new tracks that are debuting that week but still give attention to ones in the past. Over time, the site can offer a large music library that still introduces good music to those who may not have been lucky enough to be signed in when the track first came to the site. Despite some of my observations, Loudcrowd really is an innovative, refreshingly fun site and you can count me as a fan. The artistic side is very well done and very stylish. The site is a great example of taking a browser-based system and making the most out of it with the aesthetic quality. The art and music fit seamlessly together, complimenting each other and creating a solid, congruent environment. I’m also a big fan of the user profiles, they’re unique to the site in a way I haven’t seen in other virtual worlds or social networking sites. Not only can they list their favorite bands, but there is a space for favorite lyrics, most influential band and things of that nature. 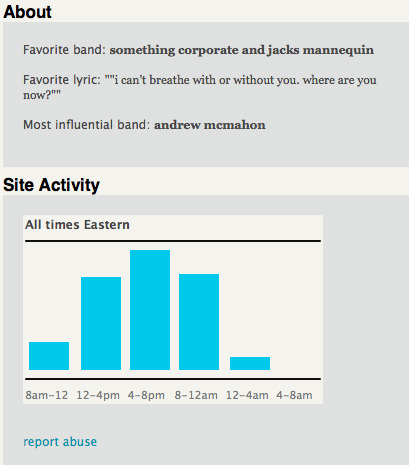 There is also a bar graph on each user’s page detailing the times the user is usually on the site. I haven’t even been able to hit all of the features associated with player profiles and I think that speaks to the potential in depth of experience. As a music lover, I’m very excited to see what else the creators have in store for Loudcrowd. The way the site blends music and video gaming only enhances each of those aspects. I spend a lot of time on the internet searching for new music, scouring sites like Hype Machine for new tunes. When you’re on the computer though, music usually serves as the background function. While I listen to new tracks on Hype Machine, I’m usually doing something else that takes away being able to fully appreciate and be a part of the music that’s playing. Loudcrowd offers a way to stay entertained and engaged with music, interacting with the beat while you discover new music. I wouldn’t normally take the time to sit down and analyze the bits and pieces but the site really speaks to me, and I’d like to see them improve on the great features they already have in place. If Loudcrowd succeeds, we can be sure to see more innovations like this in the future. So here we are, The Electric Panda is up and running. I started The Electric Panda to focus my writing attention in one area. All of my previous writing ventures are scattered about with my formal writing in the Daily Utah Chronicle and my blogging ventures existing in now deleted blogspot URL’s. WordPress is the mother of all blogging sites and I wanted to harness the full power of the blogging scene to present my message. My message of course being that the internet is crazy, virtual worlds are amazing and that everyone deserves good music (and entertainment for that matter). I’ll just let my future posts take care of that. As a side note, panda related things WILL make appearances from time to time so be prepared for irresistible cuteness. I suppose this is a long winded way of saying I’ll be posting some articles from my time at The Daily Utah Chronicle and Red Pulse magazine. With Red Pulse magazine going under, I want to preserve my writing done from that time as it was the only magazine in the state geared towards A&E for college kids. Most likely I’ll blog about this later, but the death of Red Pulse was a big smack in the face to college age kids in Salt Lake. C’est la vie, I guess. Now I will take advantage of having a wordpress blog and upload a couple songs I like. You will find them cool and refreshing like a cold lemonade on a hot summer day.